hey am I the first to post? well awlright. too sweet is the Milla. too sweet. I completely agree with you about the NaBloPoMo thing. I was surprised how much it made me want to write and now I've taken almost a week off and I feel like I shouldn't have done that, but I kind of needed/need to. Lots going on right now, especially with final projects, finals & the GRE coming up within the next 2 weeks. Gah. I have found that I kind of want to post more often. I still don't have anything much to say unless I want to talk about all the reading I'm still pursuing for dealing with R3. But I find myself with hands poised on the keyboard ready to try to write... and I have made myself NOT write a couple of times now! I didn't post on the Milla looks like Arwen post - mostly because it was soooo obviously true. I love seeing how kids look like old photos of their parents. So fun. I got addicted to posting during November and now cannot be stopped! 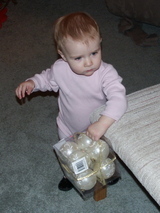 By the way- possibly the cutest tree decorating helper ever! Speaking of resemblances, is that Daniel behind Milla in the last picture? He looks so much like Rosie! Hey, do you want to call me this weekend? We should talk. Arwen, try beer bread. It's simple and never lets me down. This girl has all the fine points of making it; I like her blog. I can't speak for everyone (or maybe I can) but I think we'd all rather have a post where you picked up where you left off than nothing. ;:-) You've got your little fan club of readers, as evidenced by the many comments during November. :-) Such a cute pic of Milla. this has nothing to do with your post, arwen, but of all people, i thought that you might be able to solve this puzzle. i saw it on my cousin's facebook. what do you think? hopefully we can all answer? is it that there is no apostrophe in "whats"
Milla is too adorable :). (Daniel also loves to shout at the sight of a "ball!" which he mostly uses to refer to oranges). 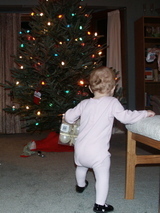 I hope your Christmas tree makes it to Twelfth Night unscathed! Eileen got the answer to that long puzzle: there should be an apostrophe in "whats." Mmmmm, drool. ;) I haven't posted here in a while and just wanted to say hi. I am so glad you guys are doing so well. Camilla is just a gem. We're enjoying just-turned-one-on-the-second Ronan over here ... it is a great age, I think.